The nasopalatine duct cyst (NPDC) or incisive canal cyst was first described by Meyer in 1914, which arises from embryologic remnants of nasopalatine duct. However, their origin is still uncertain. These epithelial remnants may have proliferation spontaneously or after trauma, bacterial infections, or mucous retention. They are the most common nonodontogenic jaw cysts which account for only 1% of all maxillary cysts. Most of these cysts develop in the midline of anterior maxilla near the incisive foramen and occur most commonly between 4th and 6th decades of life. Males are affected 18–20 times more than females. Patients become symptomatic in larger cyst with swelling, drainage, and pain. It is not uncommon to see evidence of endodontic therapy near the lesion because NPDC gets previously misdiagnosed as periapical pathology. We herewith report a case of NPDC with classic clinical, radiological, and histopathological features. A 19-year-old male patient was presented with pain and swelling in the upper front region of jaw for the past 3 days. There was no history of any trauma and the onset was sudden. The patient reported with the same history of pain and swelling 4 years back and underwent incomplete root canal treatment. Intraoral examination revealed a well-defined normal-colored oval swelling measuring about 2 cm in diameter on the anterior palatal region near incisive papilla without any discharge [Figure 1]. The swelling was firm, nonfluctuant, and tender on palpation. Fine-needle aspiration was tried, but could not draw the cystic content. On pressing the lesion, thick mucus material expressed out. Hard-tissue examination revealed nonvital (on electric pulp testing) intact maxillary right central incisor with access cavity preparation on palatal surface. On percussion, it was nontender. Both intraoral periapical and occlusal radiograph showed a well-defined, corticated heart-shaped radiolucency. It measured about 1.5 cm × 2 cm between the roots of maxillary incisors, with lateral displacement of roots of maxillary central incisors [Figure 2]. There was no evidence of root resorption. Based on the clinical and radiographic findings, the lesion was provisionally diagnosed as NPDC. Differential diagnosis included radicular cyst and central giant cell granuloma. Treatment plan included completion of root canal therapy of maxillary right central incisor following enucleation of the lesion under local anesthesia. Microscopic examination of the specimen revealed ciliated pseudostratified columnar epithelial lining with goblet cells. 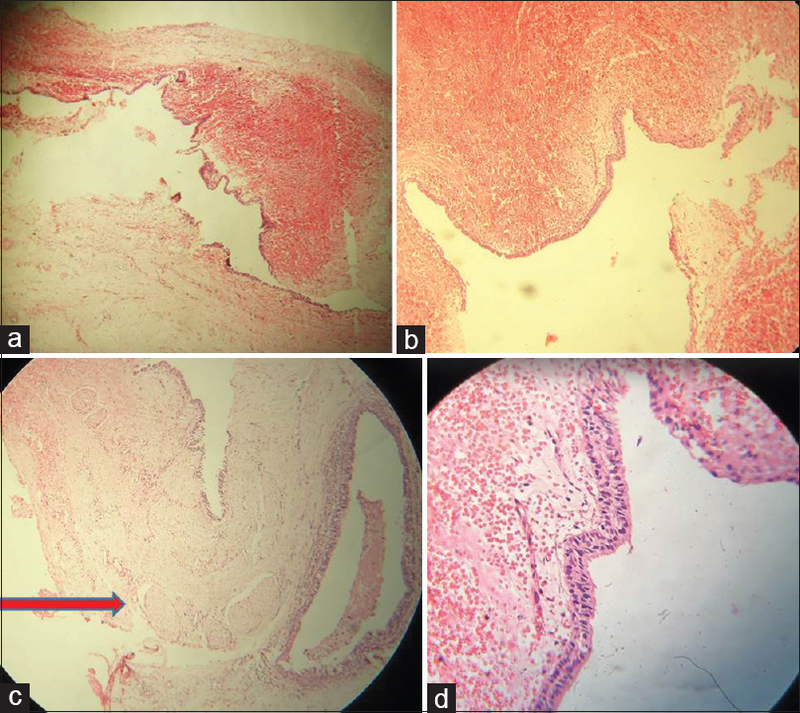 The connective tissue capsule was fibrous to fibrocellular with diffuse chronic inflammatory cell infiltrate and extensive areas of hemorrhage. Nerve tissue, proliferating duct, and vascular channels were also evident in areas [Figure 3]. On the basis of histopathological findings, the case was diagnosed NPDC. The patient was kept on regular follow-up and showed uneventful healing. NPDCs originate in the nasopalatine channel located at the anterior tip of the suture line of the palatal apophyses of maxillary bones. In lower mammals, this “nasopalatine duct” acts as an ancillary olfactory organ known as vomeronasal or Jacobson's organ. NPDCs were initially thought to be fissural in origin, but now, it is believed to derive from incompletely developed epithelial remains in the embryonic nasopalatine channel. Their occurrence is typical to anterior maxilla and its mean size varies from 6 mm to 17 mm. Radiolucency <6 mm is considered as incisive foramina. NPDC is seen as well-defined round or oval radiolucency in the midline, although some lesions may appear heart shaped either due to notching by the nasal septum during their expansion or by superimposition of nasal spine on the radiolucent area. NPDC may be easily misdiagnosed by the clinicians as a periapical lesion due to similar signs and symptoms and its prevalence rate is actually higher than that presented in the literature. Larger NPDC might show the adjacent incisor roots to be within the cystic cavity, but the lamina dura will be usually intact and the pulp usually vital unlike periapical pathologies. A reported 71.8% of NPDCs have squamous, columnar, cuboidal, or some combination of these epithelial lining types; 9.8% is seen with respiratory epithelium. This reflects the pluripotential characteristic of embryonic epithelial remnants. A chronic inflammatory reaction is noted in 81% of cases and 71% of cases presented with hemorrhage. Another helpful diagnostic feature is the presence of structural elements in the cystic wall native to the nasopalatine canal such as peripheral nerves, arteries, veins, mucous glands, and adipose tissue. The treatment of choice is surgical enucleation of the cyst, although some authors propose marsupialization of large NPDCs. The nasopalatine neurovascular bundle is a highly vascularized structure giving rise to profuse bleeding if inadvertently sectioned during surgery. Paresthesia of the anterior palatal zone is found in 10% of the cases, on removal of nerve endings of the nasopalatine nerve along with the membrane of the cyst. This case was presented with classic clinical, radiographic, and histopathological features of a NPDC. Cystic lumen content was mucous in our case unlike commonly seen straw-colored fluid which is due to uncommon respiratory epithelial lining. NPDCs are the most common nonodontogenic cyst of the oral cavity. Vitality testing of adjacent teeth involved with a cyst-like lesion in the anterior maxilla is mandatory to differentiate NPDCs from periapical pathologies. Clinical practitioners should be aware of the features of the NPDCs, so that inadvertent root canal therapy of surrounding vital teeth can be avoided. Siddappa A, Sunil SM, Kumar M, Selvamani M. Nasopalatine duct cyst – A case report. J Dent Med Sci 2014;13:46-8. Torres LM, Benito JI, Morais D, Fernández A. Nasopalatine duct cyst: Case report. Acta Otorrinolaringol Esp 2008;59:250-1. Nilesh K, Vande AV, Suresh KV, Pramod RC, Suryavanshi P, Kadam NA. A case of nasopalatine dust cyst: Presentation, diagnosis and management. J Dent Appl 2016;3:325-7. Rajendran R. Developmental disturbances of oral and paraoral structures. In: Rajendran R, Sivapathasundharam B, editors. Shafer's Text Book of Oral Pathology. 7th ed. New Delhi: Reed Elsevier India Private Limited; 2012. p. 64. Dedhia P, Dedhia S, Dhokar A, Desai A. Nasopalatine duct cyst. Case Rep Dent 2013;2013:869516.